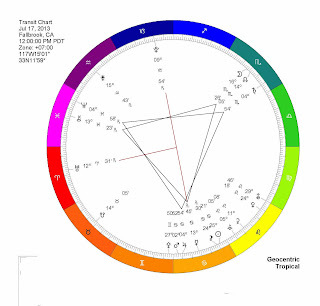 Jupiter enters the tropical sign of Cancer on June 25th, where it will stay until July 16, 2014. Jupiter has been in Gemini since last summer--the sign of its detriment. Jupiter doesn't mesh too well in Gemini; it's a strange and confining world to Jupiter who seeks to expand into outstretched extrinsic horizons. Jupiter seeks meaning, truth, and the bigger picture. Gemini, and its ruler Mercury, seek quite the opposite: a distillation of raw undigested hard data. The result is often a frustrating complacency with a mediocre awareness of what lies ahead. This has been a period of time that presented us with a lot of information, ideas, and facts that appeared quite disparate. It's like putting together a giant puzzle without the picture of the end result from which to guide you. Intuition and a sense of higher purpose can become blocked because the mind gets too much in the way with its own agenda of "figuring it out" instead of allowing a more inductive process to unfold. However, in looking at the brighter side of this transit (of which Jupiter is so good at doing), we've had an opportunity to collect and dissect a copious amount of information, and by now we're likely to have a lot of material in which to draw from and make sense of. Jupiter in Gemini can assist in simply enlarging our information base, as well as helping to improve all forms of communication. And yet, that bottom line, that deeper meaning and understanding is just so hard to come by; we just can't see the forest for the trees. Towards the end of June Jupiter makes its way into Cancer. Jupiter is exalted in Cancer, which means that it's more comfortable and supported to express its inherent nature. Whereas Gemini deals with the mind and intellectual faculties; Cancer is a realm of feelings, sensations, and deeply seated emotions. Fortunately, Jupiter is quite comfortable here, which means that it can assist each of us in getting more in touch with our sensitive nature and to deepen our trust and love for those around us. From the end of June until July of next year, Jupiter in Cancer is providing opportunities to connect more deeply with our roots: close friends, family, and loved ones. Here we are provided doorways into dimensions that are supportive, nurturing, and healing. Jupiter in Cancer is a positive ray of light amidst the turmoil and instability we find ourselves in as a society. At a time when things are so uncertain and unpredictable, this transit offers a sense of hope and greater connectivity. Collectively, there will be a strong pull toward experiences that provide a sense of comfort, warmth, and nostalgia. There will also be a greater sense of patriotism and pride for our home land or place of origin. On a subtle psychological level this transit is rather pleasant, light, and acclamatory. It generates a powerful collective bond urging us to cohere and deepen a connection with our tribe, kin, or family. It also supports us in understanding ourselves from a deeper and more profound level. Jupiter, as the planet of perspective, revels in a sort of self-psychological analysis, igniting the potential for a greater digestion of the abysmal workings of our own psyche. We can encounter or confront deep material in an open and gentle manner. We can also access feelings and emotions that are otherwise less accessible. Jupiter in Cancer is an excellent time to explore our sensitive inner world, and to trust that the universe will provide the right connections and experiences conducive to this process. While this is a rather favorable place for Jupiter to be, it's transit through this sign won't exactly be a cakewalk. While traveling through Cancer, Jupiter will involve itself with some rather intense and extraordinary aspect configurations; and upon entering this sign we're in for some very big changes. On the political level we're already noticing this develop and build, but we really haven't seen anything yet. Once Jupiter enters the picture we'll receive a massive amplification of these energies adding further fuel to the fire that's already blazing. 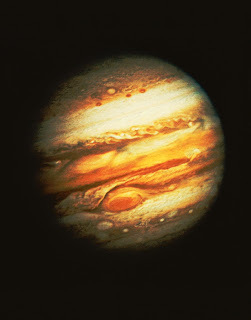 Jupiter's primary objective is inflation, by taking in more experience and awareness into reality. As long as we're open to this we'll be a lot more in synch with these energies. If we're receptive to stretching ourselves beyond the familiar and comfortable elements of our lives, we can ride this coming wave with more ease and joy. For those of us who find ourselves awake and aware of the world around us, it's likely apparent that many elements of our culture have deteriorated into a mechanized assembly line dishing out the same old crap. It's as if all originality and creativity has been sucked dry leaving us with this sense of searching and longing for deeper meaning and purpose. Just when all seems bleak, lost, and hopeless; the universe comes in to help fertilize our creativity, activating new potential and alerting us to uncharted horizons. Whatever has outlived its usefulness needs to pass on; we need to just let it go. It isn't going to get any better. The world hasn't run out of creative solutions, it's just that we've become attached to "what works" and what's predictable. If anything is certain these days it's the fact that the unpredictable has the upper hand. For some that's an unsettling prospect, while for others, a call to adventure. Let's just keep that in mind while Jupiter travels through Cancer. We're experiencing a bit of friction and flow, and such a fusion generates a powerful creative influx. If you've felt stuck, stagnant, lost, confused, or just plain bored; you can jump on the coming wave and go for the ride. Move with your hunches, instincts, and feelings--trust your inner intuitive awareness to guide you through this passage. The more open and receptive we are now, the more successful we'll be in channeling all of this into positive and constructive efforts. Jupiter's transit through this sign is an incredibly significant marking point and one that's bound to be historically as well as personally memorable. As Jupiter moves into Cancer it will progressively form a water grand trine with Neptune and Saturn. These grand trines have been forming throughout the month of June, so we're all quite familiar with this energy. When Jupiter enters the picture it magnifies and anchors this process, allowing us to further solidify the intangible by creating a more secure and rooted foundation. Many of us may be experiencing vivid, powerful, and profound dreams--as well as clear and dynamic creative visions. We're also itching for some kind of change or breakthrough in our lives, no matter how large or small; we all need something to shift. This grand trine isn't going to push us, but will inspire us in many ways, so stay receptive to what emerges from the depths. Look for insights coming from within yourself, and trust your instincts and hunches. This is a time when our inner voice is just a little bit louder than usual. At the end of July Jupiter joins in on an extraordinary configuration of planets. This is an incredibly harmonizing and energizing force field. Water and Earth signs will be the most effected by this structure. This provides an optimal balance between hard and soft aspects--a blending of friction and flow. I'm calling this structure the Creative Catalyst of Change, because it provides a plentitude of exciting creative energy and the momentum to make use of it. It'll be very interesting to see what emerges from this on the collective level. With a T-square between Uranus, Pluto, and Jupiter as the centerpiece of this configuration, we're bound to see a lot heating up. It seems the best advice in handling all of this energy is to consciously flow with it. That means that we need to be grounded and strong in our own personal center. If we're firmly rooted and directed toward something, we can allow this creative influx to permeate and flow through us without carrying us away. Jupiter will be within orb of a T-square with Uranus and Pluto throughout the Summer of 2013, and so there's likely to be a lot of action leading to big changes and breakthroughs. As far as all the current political tension goes, it's only going to amplify, so be on the alert for that. We're entering a very fertile time of innovation and creativity within varied creative and scientific fields. This Summer will set off a process that will gradually unfold and develop through to Spring of next year. Again, that means that we're all going to feel an increasing sense of pressure to bring fresh air into our lives. Jupiter turns retrograde in November of 2013, and enters back into this T-square again in January/February of 2014. It will turn direct in March of 2014, and form a more precise T-square in late April of 2014. See this summer as a critical starting point, and get ready for a powerful clearing of the house! Jupiter will begin a series of trines to Chiron in Pisces beginning in late August. Jupiter and Chiron will be slowly forming a water grand trine with Saturn in Scorpio through to next spring, coming into sharper focus in May of 2014. Jupiter trine Chiron opens us to resplendent healing opportunities. New dimensions and doorways will be emerging, allowing us to find the support needed to effectively heal several aspects of our lives. This is also an incredibly powerful aspect opening up psychic and intuitive channels, creating a collective surge of increased awareness and numinous perception. Beginning with the water grand trines in the Summer of 2013, we're in a rather lengthy process that's incredibly conducive for the development of our higher faculties. In May of 2014 the Jupiter, Chiron, and Saturn grand trine allows us to mend our relationship with authority, structure, and discipline. This also symbolizes a collective process of healing and integrating "the father " or "divine masculine" archetypes within each of us. This is an an exceptionally relevant theme in our current era, because we're living in a time of increased paranoia and distrust of authority. This is all perfectly warranted given the actions of governments, political leaders, and the big businesses and corporations--surreptitiously shifting the edifice of our society from behind the scenes. Pluto in Capricorn draws our attention to the corrupt and corrosive elements of our power structures and systems, and it's just a natural time for renovation and revolution. With that said, however, I'd invite each of us to look deeper at the root of these issues, because in reality the external elements of our society only reflect our internal state. In other words, we're not really victims of greed and the corruption of power; that's an illusion and a convenient scape-goat that allows us to abdicate our own responsibility. This grand trine invites us to look at our wounded relationship to the divine father, which goes back far into our collective memory to the advent of our current patriarchal society. We're emerging upon a critical threshold that's really a balancing of masculine and feminine archetypes within the collective psyche. Before we can effectively bring balance we must heal our relationship with the divine father, and realize that true authoritative love exists deep within each of us. Authoritative love is the enforcing of rules, boundaries, and restrictions that comes from a place of true love and an authentic desire to protect others from the dangers inherent to our world. In our current western culture there are very few effective models for this which is why this is such a challenging process for many us. The Jupiter, Chiron, and Saturn grand trine gives us the collective opportunity to find ways of healing our relationship to the divine father by seeing our current situation as merely a reflection of our relationship to our own inner authority.